I don't know about you but in this house when it's fall time that means pumpkin recipes, basically EVERY week. It's a bit much I know but we just love it so much that I wanted to share with you some of my favorite recipes I've come across so far. 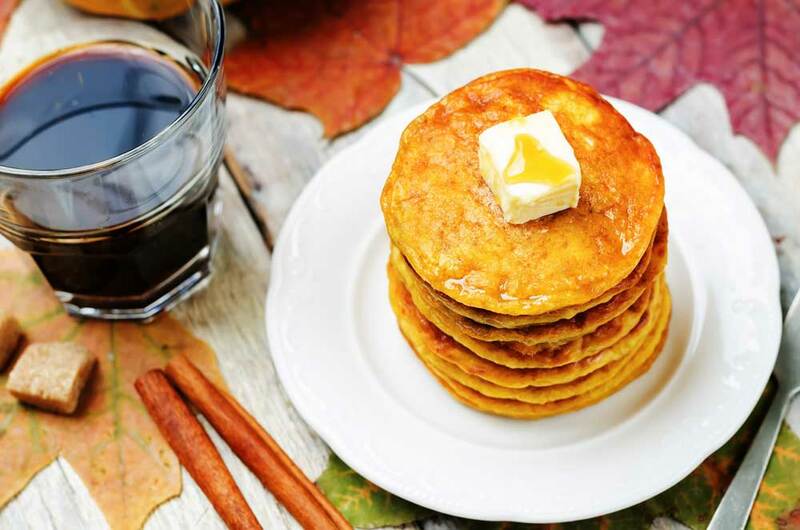 Pumpkin Pancakes - These pumpkins are so easy to make and are so fluffly. I love them because when I was looking online for pumpkin pancakes there were some with like 2 1/2 cups of flour, as much as I'd like that many pancakes its not practical. These are the perfect amount of pumpkin. Highly recommend! Pumpkin Chocolate Chip Muffins - These muffins are incredible! They are so moist and yummy. I like them because they are on the healthier side of some muffins but these are so good to grab and go with for a little afternoon snack! Soft Baked Pumpkin Cookies - I haven't tried these yet, but they remind me of the Kroger bakery cookies with the soft cookies and frosting on top that I try not to grab EVERY time I see them. So Im excited to try this recipe out next weekend! Pumpkin Fluff - I could eat this by the handful with no shame. It's so good with simple ingredients. It's the perfect thing to bring to any get-together people will just eat it right up. We love to pair it with graham crackers or our favorite is cinnamon stick graham crackers which make it super easy to scoop up and eat. But according to the recipe, some people eat it with ginger snaps! Pumpkin Roll - Now for the grand finale. 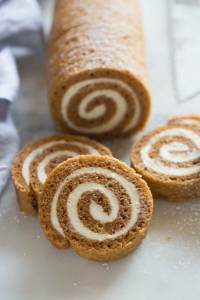 Henry LOVES this pumpkin roll, he says he would eat it like a burrito if he could ... no words but this is a super good recipe. It has really helpful tips because this is a tough thing to make with rolling the cake. Its worth all the work though and I was surprised how good it turned out! SO, now I shared my favorite pumpkin recipes with you, you must share your favorite with me! Let me know if you guys like this type of posts and want more! It was fun to do something different! Hi Friends! I hope that you are having a good week! So as some of you know I was participating in a smoothie challenge with my sister and I wanted to share how it went! This ladies and gentlemen are not your tropical smoothie lets just make that clear now. There are smoothie recipes available online, and more through her book which my sister had. The whole thought process on the smoothie is that you should have enough nutrients in the smoothie that you shouldn't eat until lunch. There also is enough fat, protein, and fiber to keep you full and not enough sugar to spike your blood sugar. I made it through 20 days of the smoothie challenge. I couldn't do it all week, I had to allow myself some days to just eat normal food. At first, I felt really full, but some days I wasn't working out in the morning and it was a lot to try to drink a whole smoothie right when I wake up. Because this smoothie is made with so much liquid and not a lot of frozen items it separated QUICKLY. But I do have to say that from now on when I make smoothies I will take this idea with me, a little less fruit, more almond milk and the incorporation of protein, fiber and fat. The working out? I was able to get in 6 days a week of active time. I had to give myself one day off because I'm an all or nothing girl and usually if I miss one day, I quit. I wanted to set myself up for success but hey, life happens too. Overall I really liked the idea of 30 active consecutive minutes. I walk to work from my parking garage and get 30 minutes that way some days but not consecutive. This changed my thinking a little about working out and I really liked this. I'm going to be honest, I liked the smoothies for like 4 days and then I hated it. I get the theory of staying full longer, but some days I just couldn't get the smoothie down and I was hungry in two hours. But I think I learned what to put in my smoothie to make them better for me. I realIy liked the exercise part of things, I am still trying to continue that challenge. Even if my 30 minutes is just walking. Im learning its important to move my body every day. What do you guys think? Are you going to try the challenge? My advise would be have a friend do it with you and send photos of your smoothie every day. Thats what my sister and I did! You know all those recipe videos you see on your Facebook feed ALL the time? Well I got a cookbook of it! I had to! I LOVE cooking, I meal plan about 3 meals for H and I every week. And I usually don't repeat recipes, I'm crazy I know. But I loved the tasty recipes and I'm try to collect some cookbooks rather than go on Pinterest every week. First Impressions: I thought it was really cool, I liked the recipes they seemed easy to make. The recipes weren't something I usually made but they looked good. They are laid out nicely and pretty much have step by step photos. After the excitement wore off: I was sort of disappointed. Most of the meals aren't very healthy and I try to cook as healthy as I can. I also felt like the coped out, for example in the vegetarian section there was pancakes. I think everyone knows pancakes are vegetarian. I was looking for meal substitutes but oh well. There are only about 5 recipes per section. The section I liked the most: Side's and Salads. This was my favorite because there were recipes like Healthy Chickpea & Black Bean Salad, Grilled Veggie & Steak Salad. The section I liked the least: Vegetarian Meals. When I selected this section I was thinking it would be meals thats full of veggies. But there were things like pancakes, I've never seen a non-vegetarian pancake. So needless to say I felt slighted. My recommendation: I wouldn't get it, if I were you I'd just pick recipes you like off of their facebook. This book is pretty small and not sturdy. So unless you're showing it off it's not a great cookbook for the shelf. Just not worth it in my opinion when you can get their recipes for free. I may invest in a Goodful cookbook (their healthier version of Tasty) but even so the recipes aren't consistent and I can get it online.